In an O.R., the ability of the surgical team to clearly see the operating field is imperative. Modern surgery lights are designed to focus and eliminate shadows in the surgical field. Surgical lights are so advanced, they can eliminate the shadow cast by the surgeon’s body and hands. Lights are configured to best suit the needs of the facility, the surgeon, and the surgery itself. The lightbulbs are arrayed in a light head. The light heads are mounted on an arm. Arms are then mounted via a plate, channel, or boom system. Arms hold their position by either a counter-balance or hydraulic system. Some models of surgical lights are mounted on a wall or on a wheeled mobile stand. Wall-mounted lights are more often seen in procedure rooms or in facilities where, for a variety of reasons, the vertical structure can be better supported than the joists overhead. Mobile lighting is most often seen in temporary or small facilities throughout the world. The most common configuration of operating room lights we see is a dual-head or triple-head ceiling mount. ‡ Some pendant, or boom, systems will also hold a variety of equipment other than lights; including patient monitors, anesthesia machines, endoscopy equipment, surgical microscopes, crash carts, pharmaceutical cabinets, and more. These suspended systems are valuable to keep the floor clear and more easily sanitized. Obviously, these hold a great deal more weight and require a structural engineer’s design and appropriate building construction. While older operating lights utilize halogen bulbs, newer lights use LED bulbs. LED bulb manufacturer information states the life of the bulbs are about 30,000 to 50,000 hours of use. This is much longer than the halogen bulbs’ usage duration estimates of approximately 1,500 to 2,000 hours. Halogen bulbs use a filament inside a gas-filled container. The more electricity, the brighter the bulbs glows, and the whiter the resulting light. Halogen bulbs heat the area under these lights and touching one can burn skin and melt thin plastic. LED is an acronym for Light Emitting Diode. These microscopic electron particles move and create light energy when powered by electricity. As with Halogen, the more electricity, the brighter and whiter the light emitted. LEDs burn much cooler and are generally only warm to the touch after extended continued use. Surgeons are generally concerned with two things: Color and Temperature of the light. In some procedures, the color of the surgical site is critical to the success of the procedure. Operating Room lights generally project light in a variation of a basic conical pattern; the tip of the cone is on the, in this case, operating field surface. O.R. lights have a predetermined focal distance and area. Both the vertical distance between the light head and the subject – as well as the diameter or spread of the light are measured. Some lights have adjustable focus within a set range. The color temperature is measured in degrees using a Kelvin scale of thermodynamic temperature. For example, natural daylight is measured at 5100° Kelvin. Halogen bulbs are generally around 4000° Kelvin while LEDs are around 4300° Kelvin. 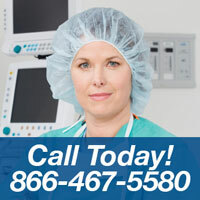 For surgical lighting, the number closest to daylight will be preferable. Lux is the measurement of light intensity and is measured in lumens per meter. One lux equals one lumen per square meter. This is the more common measurement seen in surgical lighting specifications. Most O.R. lights put out more than 40,000 lux, with higher numbers being more desirable than lower numbers. Footcandles are an alternate measurement unit of light intensity. They measure one lumen per square foot (10.764 lux – which measures by the square meter). This scale isn’t used as often. If you’re shopping lights, be sure to convert specifications to the same unit of measure. Color Rendering Index, or CRI, describes how the human eye interprets the color of light. The scale is zero to 100, where the higher number delivers a more accurate color delivered across the color spectrum. In everyday language, we’d probably refer to light as “warm” (red tones) or “cool” (blue tones); a high CRI would be the most neutral white light. Generally, the medical industry allows a CRI of 92, or higher, as acceptable for a surgery light. Major brands available in the U.S. include Steris (Amsco), Skytron, Maquet, Chic / ALM, Medical Illumination, Sunnex, and more. If you have any questions about specific lights, please call Heartland Medical Sales and Services for more information.